Monitor various aspects of your Linux devices, receive instant alarms as soon as one of your checks fails, and act before the little things turn into bigger problems. Avoid costly downtime by scheduling maintenance work in advance, instead of simply reacting to problems and service calls. Create as many checks as you need, and configure different thresholds, alert recipients, and more. Create individual TeamViewer Monitoring policies to accommodate the various needs of your clients, departments, or single devices. You will be notified as soon as one of your checks fails. Customize your alerts to make sure the correct person gets the right alert at the right time. In addition to alerts in your TeamViewer client, you can set email notifications to go out as soon as a check fails. 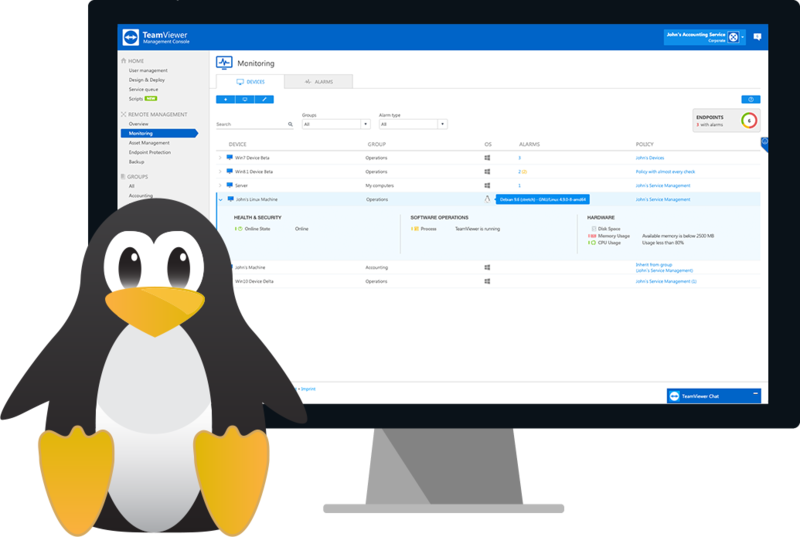 TeamViewer Monitoring for Linux lets you monitor important aspects of your Linux devices. Triggers an alert as soon as the available space on a disk falls below a set threshold. If the average load of a processor exceeds the set threshold, an alert is generated. Should a device go offline, an alert will be triggered. Notifies you if a specified process is or is not running. Get an alert when the average available memory falls below the set threshold. TeamViewer Monitoring comes with an elegant Asset Management solution that allows you to keep track of your deployed assets, and gain insight into your IT infrastructure. Create comprehensive inventory lists in no time! List hard- and software across all of your Linux devices in your network within seconds from one convenient dashboard. Get valuable information about your supported devices upfront. Know what Linux distribution they are running, the internal and external IP addresses, hardware in use, and much more! Activate TeamViewer Monitoring & Asset Management Today!